It's finally Friday! Is it just me or did this week feel like it lasted FOREVER?! Before I sign off for the week, I just wanted to tell you about a new cookie one of my co-workers introduced me to. 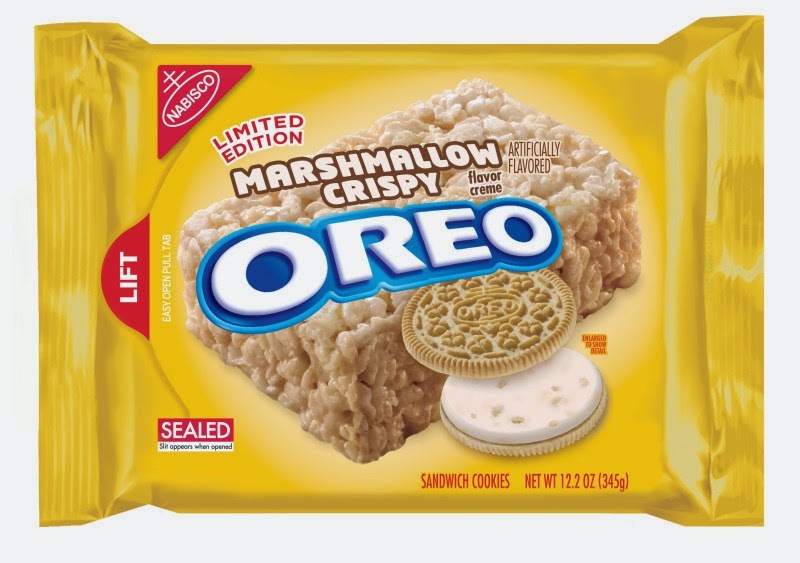 They are the Marshmallow Crispy Oreo cookies. They're limited edition so stock up while you can! These cookies are so ridiculously yummy!!! I don't have a major sweet tooth but these cookies are addictive. You have to try them! Heat the extra virgin olive oil in a medium skillet. Add the onion to the skillet and sauté until the onions soften. Once softened, remove from the heat and set aside. Next, cut the baby bell peppers in half and remove the core and seeds. In a small bowl, combine the ricotta, onions, herbs and salt and pepper. Spoon the mixture into each pepper. Spray the cookie sheet with cooking spray. Place the peppers on the cookie sheet and bake for about 10 - 15 minutes. Or you can grill your stuffed peppers which is what Luke did. Either way, they're delish!!! These really are a great appetizer or side dish! 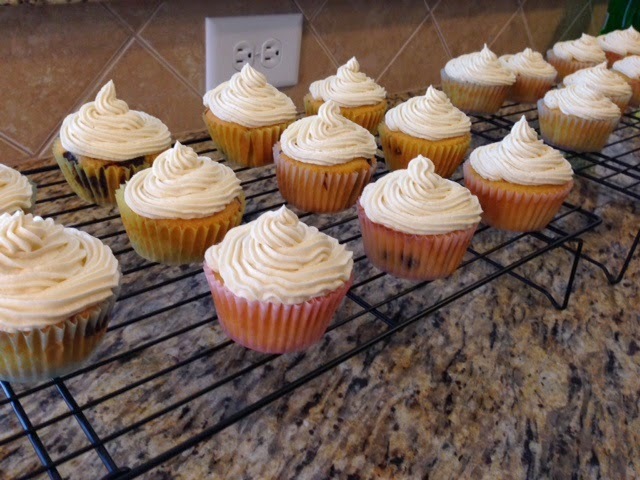 I thought buttercream frosting would be a yummy on the cupcakes, but instead of just spreading the frosting on the cupcakes, I decided to swirl the frosting on with a decorating tip. Keep in mind I've never taken a cake decorating class so I'm no professional. I'm also a little impatient so I didn't take the time to practice swirling the frosting. I just went for it. They're far from perfect, but it was a lot of fun swirling the frosting! Preheat the oven to 350 degrees. Spray the muffin tin with cooking spray. Your box mix will have 2 packages inside (one package is yellow cake mix and the other is the chocolate mix). 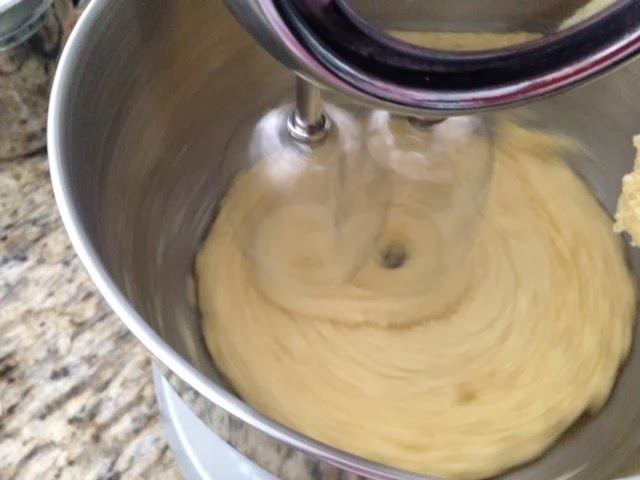 In a large bowl, mix the eggs, water and vegetable oil with the yellow cake mix. Once combined, reserve 1 cup of batter in a small bowl. Then pour the remaining batter into the muffin tin. Next, pour the chocolate mix in the bowl with the reserved cup of the batter and stir to combine. Then stir in the chocolate chips. 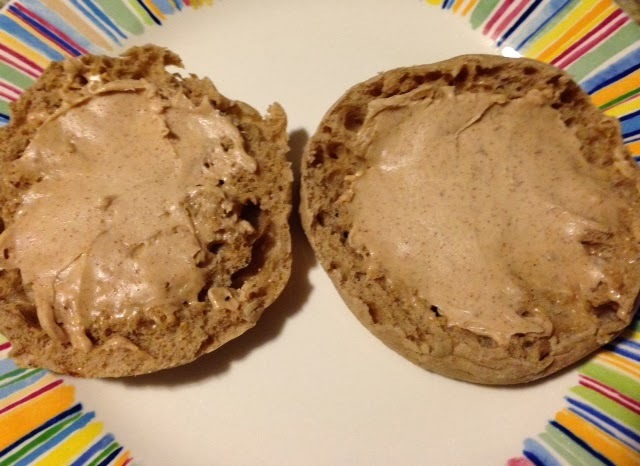 Spoon the chocolate mixture into the muffin tin over the batter and swirl into the batter. Bake for about 18 - 20 minutes. While the cupcakes cool, start on the frosting. I found the buttercream frosting recipe here http://savorysweetlife.com/ but I adjusted it to get it the way I wanted it. Below is the recipe for the frosting I made. Using a mixer, beat butter and then add the sifted powdered sugar. Once combined, increase to medium speed and add vanilla extract, salt, and 2 tablespoons of heavy cream and beat until all ingredients are combined. 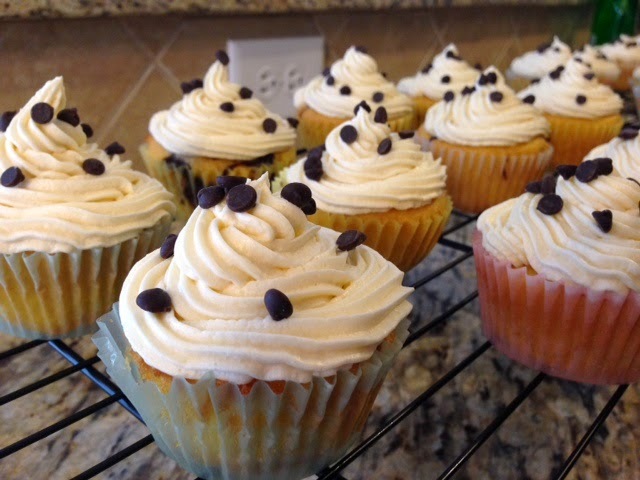 If you like a thinner frosting, you can always add more heavy cream. 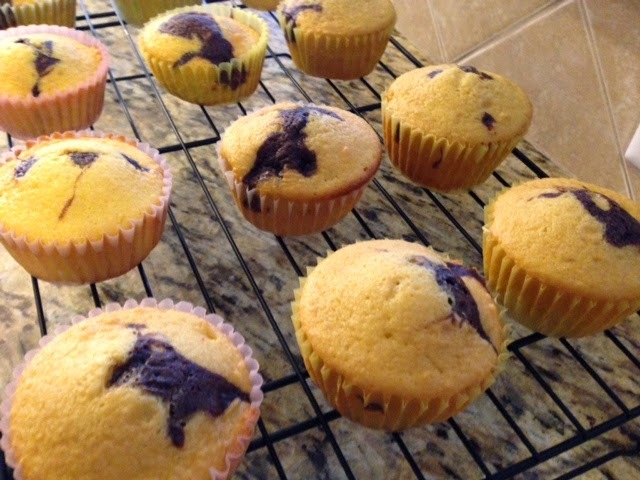 After frosting the cupcakes, sprinkle the cupcakes with mini chocolate chips. 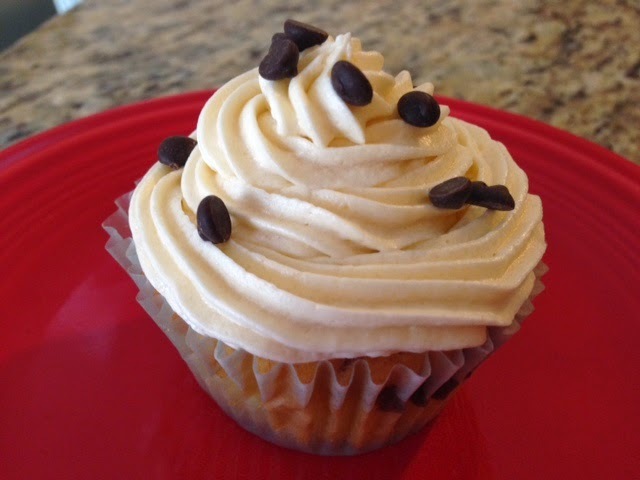 I used mini semi-sweet chocolate chips. Why do the weekends always fly by? It's so not fair. Luke and I had such a nice weekend. He played golf Saturday and Sunday and I just enjoyed doing what I wanted, even if that meant doing nothing. If you know me, you know I can't sit still for too long so my doing nothing only lasts about 30 minutes. Saturday night was our date night. We had dinner in downtown Columbia, SC at a restaurant called Basil. It's a Thai restaurant and it's super yummy!! The first time we went to Basil was a few years ago in downtown Charleston, SC with my brother and his wife and we loved it. So Luke and I were both really excited when a Basil restaurant opened in Columba last year. Yesterday I spent most of my afternoon in the kitchen. Luke and I had separate meals for dinner but we cooked and ate dinner together so it worked out. :) For dinner, I had Giada's lentil burger. Giada De Laurentiis is one of my favorite Food Network chefs. I love her show and her recipes! 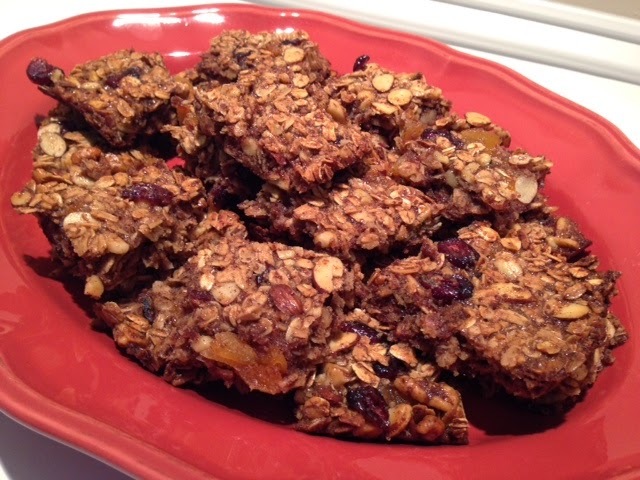 Over the years, I've tried so many of her recipes and they've all turned out delicious. I recently bought her new cookbook, "Giada's Feel Good Food" which offers a wide variety of recipes. I've already tried several of the recipes in this cookbook and none of them have disappointed. In a medium skillet, heat 1/4 cup of olive oil and add the shallots along with 3/4 teaspoon of salt and 1/4 teaspoon of pepper. Cook until shallots are softened. Then add the garlic, mushrooms, thyme and 3/4 teaspoon of salt and 1/4 teaspoon of pepper. Cook until mushrooms are soft and set aside. Using a food processor, puree the peas and half of the lentils until smooth. Then spoon into a bowl and add the remaining lentils, 1/3 cup of cornmeal, mayonnaise, lemon juice and mushroom mixture. Mix together with a spoon and then form into 6 patties. Sprinkle 1/4 cup of the cornmeal onto a cookie sheet and place the patties on top of the cornmeal. Then sprinkle the remaining 1/4 cup of cornmeal on top of the patties and refrigerate for at least 30 minutes. Heat olive oil in a large skillet over medium high heat. Cook the patties in the skillet until golden brown on each side. In a small bowl, stir the mayonnaise, basil and lemon zest until combined. Place the patties on top of butter lettuce. 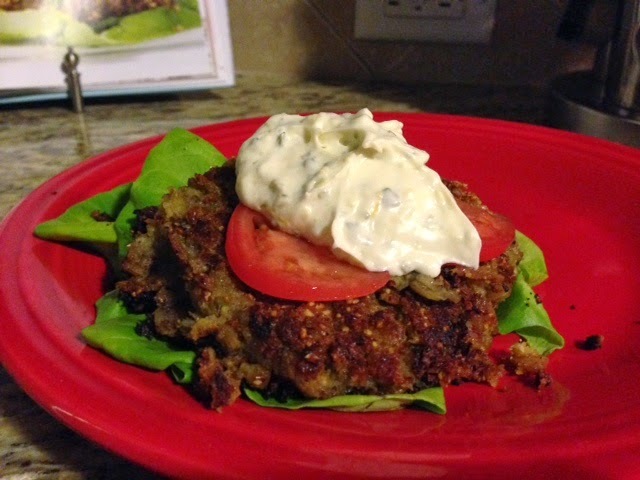 Then top each pattie with sliced tomatoes and a dollop of the mayonnaise mixture. HAPPY FRIDAY!!! We survived another week! Earlier this week, Luke and I made homemade ice cream with our Cuisinart Ice Cream Maker. I can't even begin to tell you how great it is! We absolutely love it! It's so easy to use and the ice cream is so much better than any ice cream you buy in the store. This week we made chocolate caramel ice cream and then we made strawberry ice cream. Both were so yummy! We used the recipe that came with the ice cream maker because we haven't mastered the ice cream recipes yet. Last night, we decided to make a milkshake using the strawberry ice cream. First, put your diced strawberries into a bowl. Sprinkle about a tablespoon of sugar over the strawberries and let it sit for a few minutes. 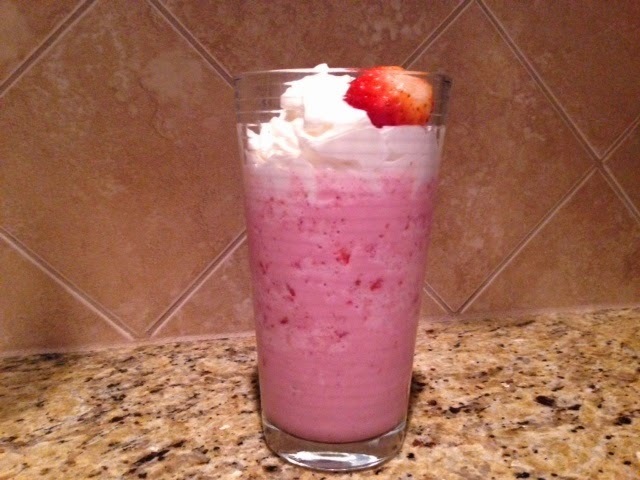 Next, spoon the pint of ice cream and cool whip into a blender along with the milk and diced strawberries. Blend until combined. By the way, I mentioned last week that Izzy seemed to be feeling deprived of my attention so I spent a lot of time with her last weekend. 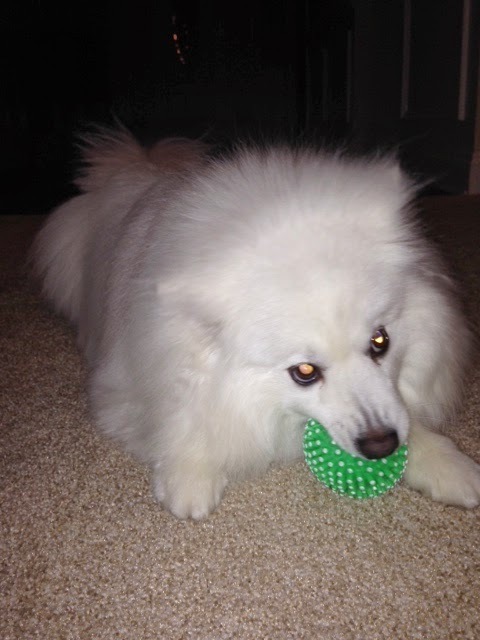 I threw tennis balls for her to fetch in the backyard, we went for a walk and I gave her a new toy. 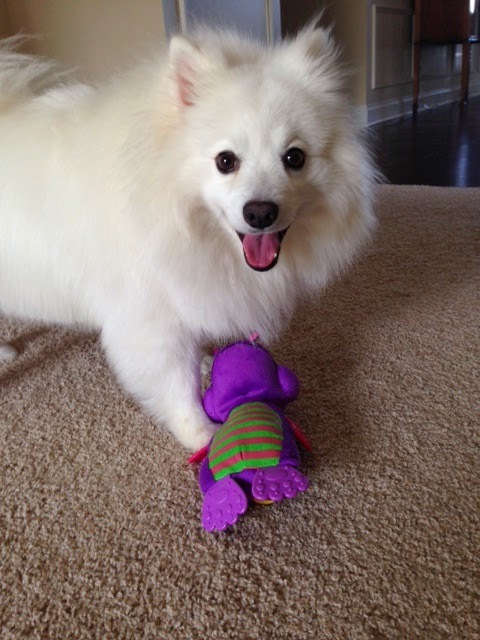 As you can see, she was a happy girl! I used to follow every step to every recipe I tried and if I didn't like it, I just didn't make it again. Over the years, I've learned I can take a recipe and change it until I like it. These days it's actually very rare for me to follow a recipe exactly as it's written. 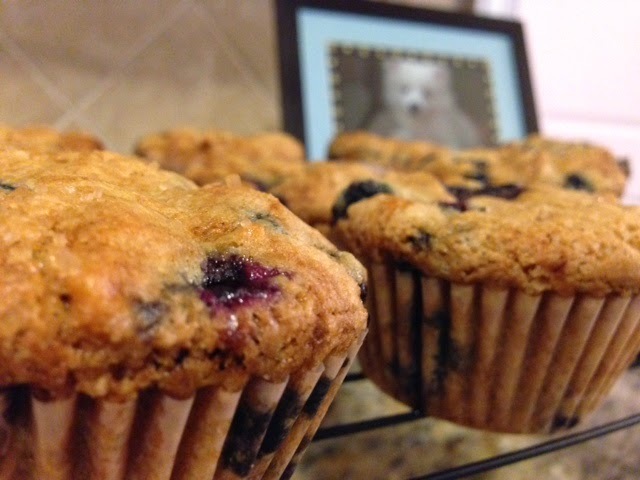 The first recipe I took apart and made my own was a Sunny Anderson muffin recipe. I made her recipe a couple of times but decided there were some things I wanted to change. Her recipe called for strawberries, bananas, blueberries and nutmeg with only a pinch of cinnamon. First I decided to eliminate the strawberries and bananas because I thought there was just too much going on in those muffins. 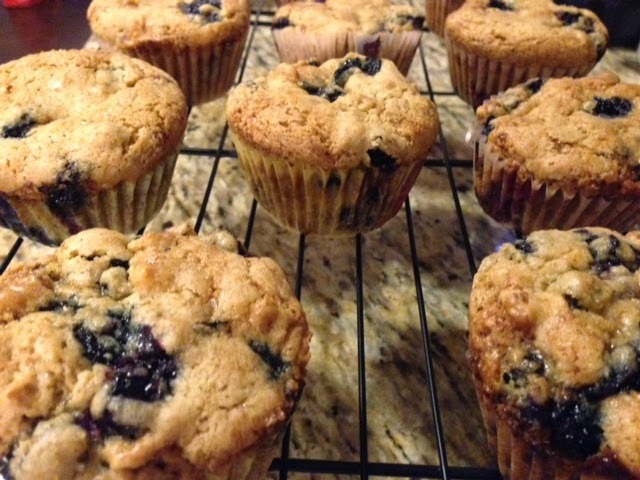 With those gone, I liked the muffins better but I still wasn't completely happy with the recipe. The flavor of the nutmeg was too strong so I decided to add more cinnamon and less nutmeg. It took me a couple of attempts to figure out the right amount of cinnamon but now the recipe is exactly the way I want it. Preheat oven to 350 degrees. Make sure you spray the muffin tin with cooking spray. In a bowl, combine the flour, nutmeg, cinnamon, baking soda and salt. In a separate bowl, whisk the eggs, canola oil, and sugar together. Pour the dry ingredients into the bowl with the wet ingredients. 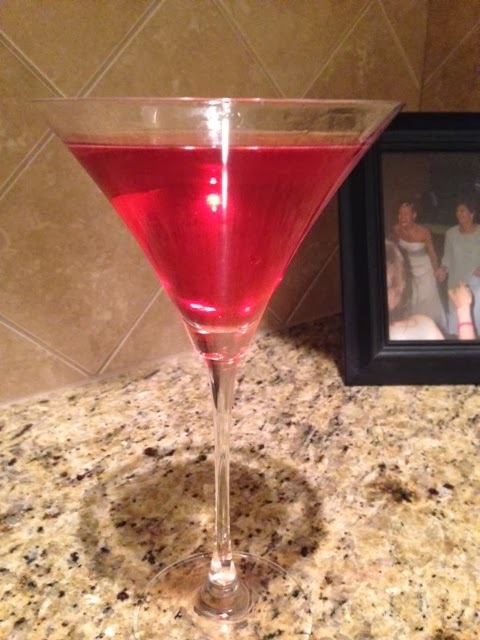 Using a mixer, mix the ingredients until combined. Then fold in the blueberries and walnuts. I love looking through cookbooks to get ideas for new recipes, but when I'm in a hurry and need a dinner or dessert idea quick, I find myself Googling recipes. I've found some of the best recipes online which is one of the many reasons I decided to start blogging about food. 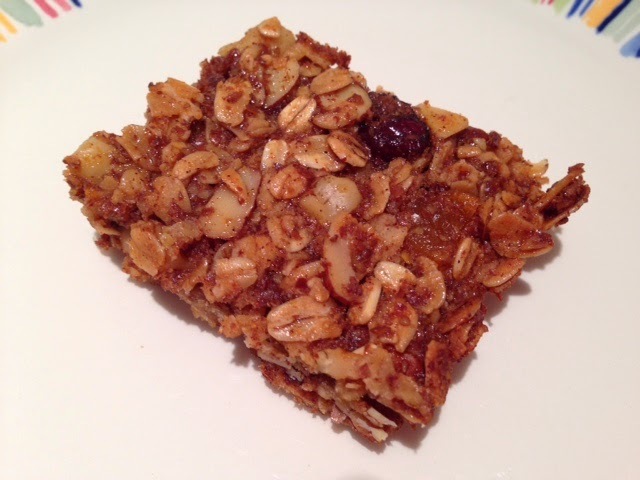 I'm really enjoying reading other food blogs and trying some of their recipes. Preheat the oven to 350 degrees. Stir the refried beans and the rotel tomatoes (or salsa) together and pour into a greased 8x8 pan. Bake for 10 - 15 minutes. Remove from oven and sprinkle 1 cup of cheese over the top of the beans. Then put back in the oven for another 5 minutes. If you don't want to take the time to bake the refried beans, you can just mix the refried beans and rotel tomatoes (or salsa) in a microwave safe bowl and warm the beam mixture in the microwave on high for a few minutes until heated through. Preheat oven to 425 degrees. Place flour tortillas on a flat surface and spoon the refried bean mixture onto each tortilla. 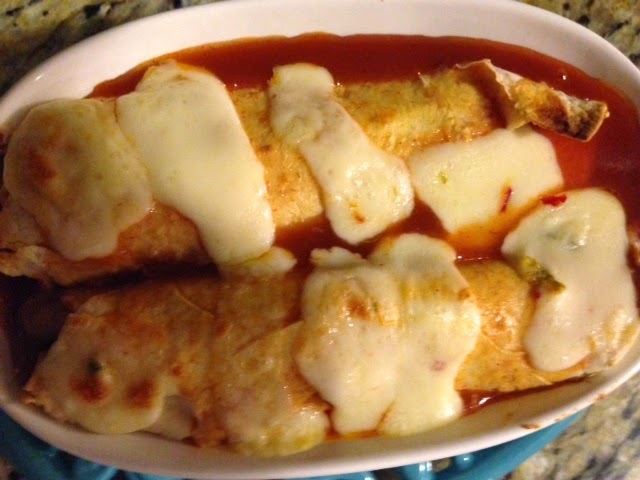 Sprinkle remaining cheese over the bean mixture and roll up each tortilla. Place the tortillas on to a greased cookie sheet, flip the tortillas over every few minutes and bake until brown (about 5 - 8 minutes). 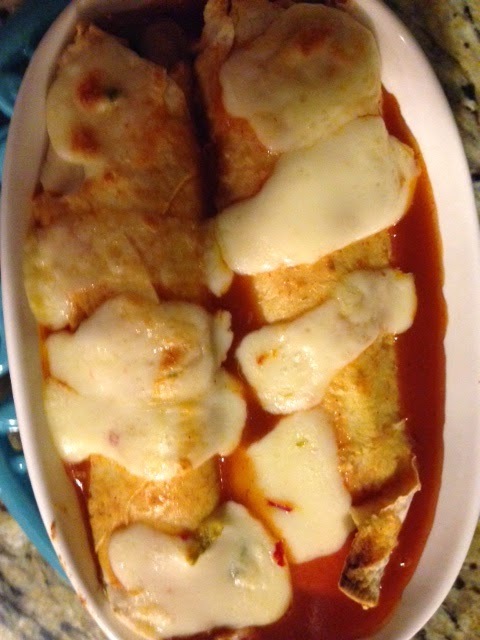 Top with some of your favorite salsa or enchilada sauce and more cheese, if desired. If your using leftover refried beans like we did or if you decide to skip the baking step, this recipe should not take more than 15 minutes. I'm super excited about this season of Dancing with the Stars! I'm already ready for next week's episode! I don't think the cast could get much better than this one! NeNe is hilarious, Candace Cameron Bure is absolutely adorable and who doesn't love Winnie Cooper (Danica McKellar)! I'm a huge fan of Candace Cameron Bure so I'm definitely pulling for her. She seems like such an incredible person. I read her first book "Reshaping It All" and her new book, "Balancing It All," is on my list of books to read this summer. So who are you pulling for on DWTS? 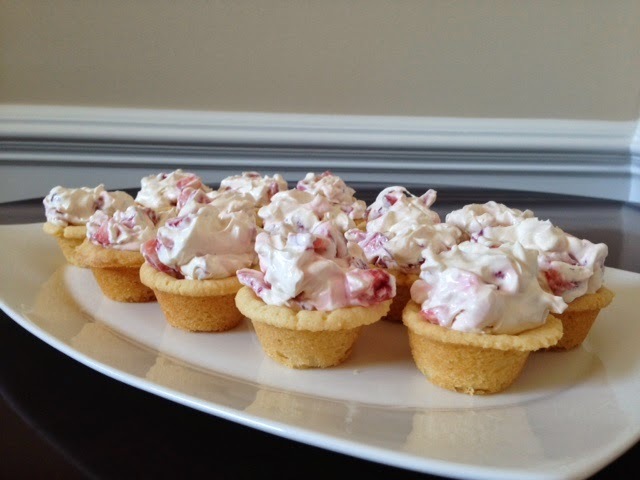 For Sweet Tooth Tuesday, I decided to recreate one of my friends yummy desserts. She makes the best fruit pizza! It's one of my favorite spring and summer treats. Last week, I started craving her fruit pizza but I decided to take the sugar cookie crust and orangey topping from the fruit pizza and make something new. Strawberries were on sale this week which worked out great because they are the perfect fruit for my makeover dessert. 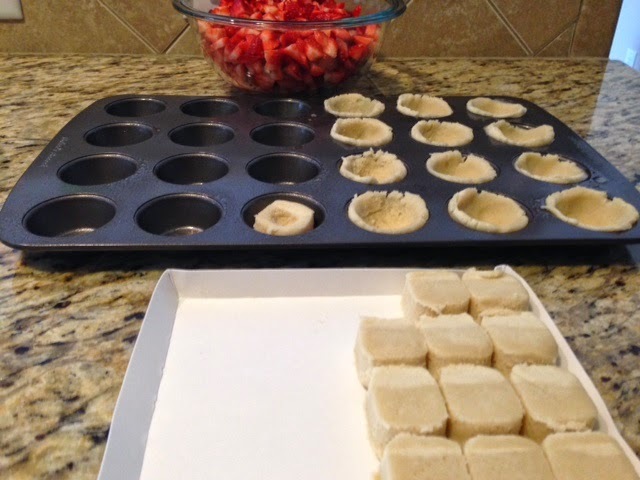 In a mini muffin tin, press the individual sugar cookies into the individual cups. Bake according to the package instructions. While the cookie cups are cooling, mix the cream cheese and vanilla extract. Then add the cool whip. 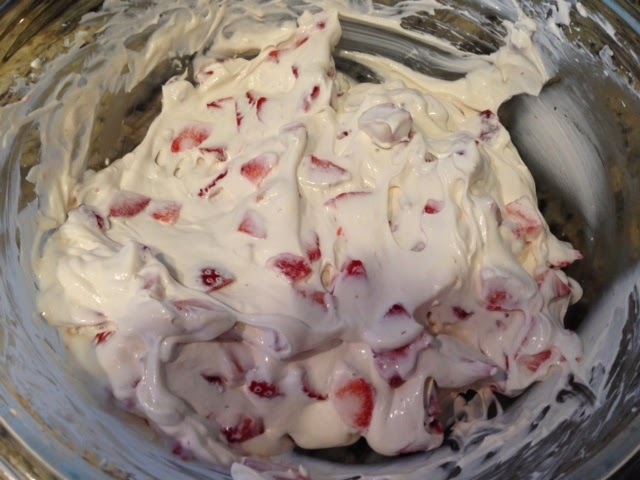 Once incorporated, stir the strawberries into the mixture. 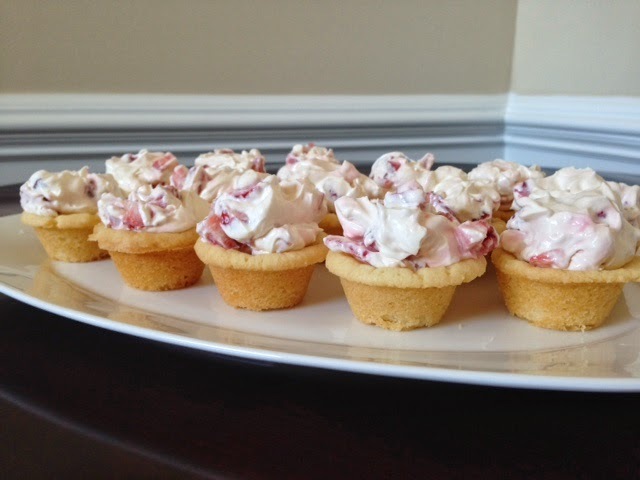 Spoon the strawberry mixture into the cooled cookie pies and refrigerate. In a saucepan over medium heat, whisk the sugar, salt, corn starch, orange juice, lemon juice and water. Bring to a boil, continue stirring and cook for about a minute. Remove from heat and allow to cool but not set. Drizzle the orange glaze over the strawberry cookie pies and serve. Happy St. Patrick's Day! Yesterday morning, it occurred to me that today was St. Patrick's Day. The day just snuck up on me, but I had to do something to recognize St. Patrick's Day. While I was trying to figure what I was going to make, I starting thinking back to a weekend we spent in Savannah, Georgia a long time ago. When I was about eight or nine years old, I was in the Girl Scouts. My Girl Scout troop spent a weekend in Savannah so we could learn more about this history of the Girl Scouts and tour the house of the Girl Scouts founder, Juliette Gordon Low. It was St. Patrick's Day weekend. I had never seen St. Patrick's Day the way I saw it in Savannah. All of the lines in the street were painted green, the water in all of the fountains were green and the adults walking around downtown Savannah were drinking green beer. It was fascinating to all of us! 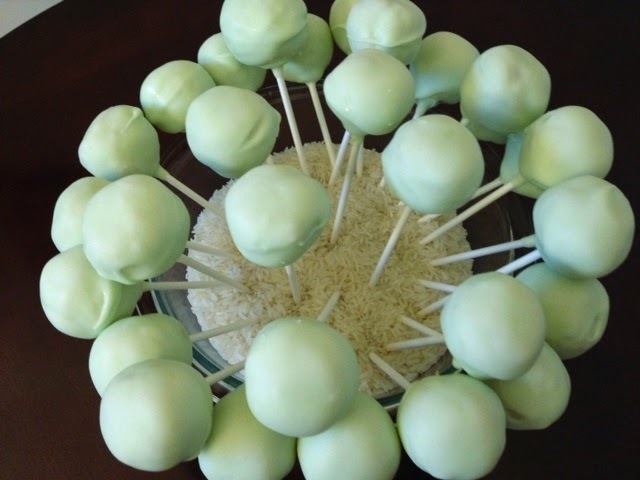 For St. Patrick's Day, I decided to make St. Patty's Day Cake Pops. 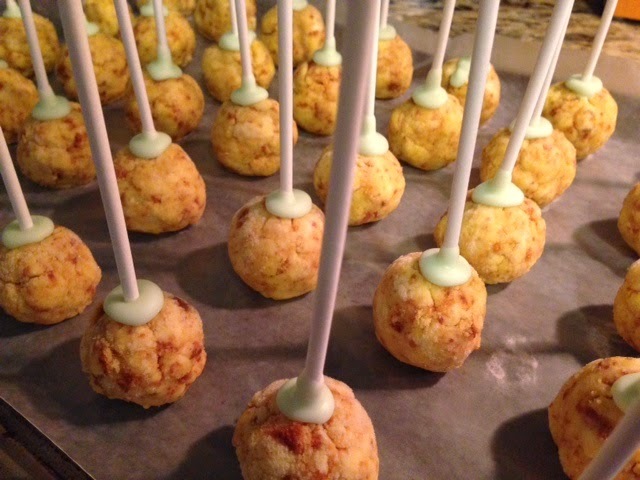 The cake pop recipe is actually my mom's recipe. She started making red velvet cake pops and brownie pops years before it became popular. My mom is such creative cook!! Follow the instructions on the cake mix box and bake accordingly. Allow the cake to cool. Cut off the edges of the cake because the edges are too crisp to use. Then remove the center of the cake from the pan and put into a bowl. You want the cake to still be warm when you add the cream cheese. Mix the cake and cream cheese together with your hands. 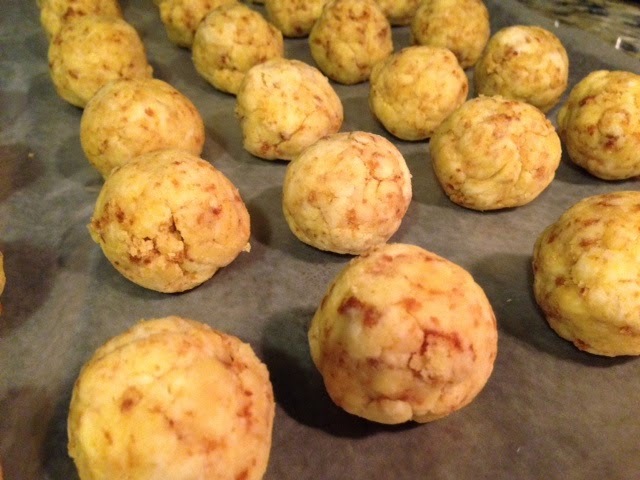 Pinch off bite size pieces and roll into balls. 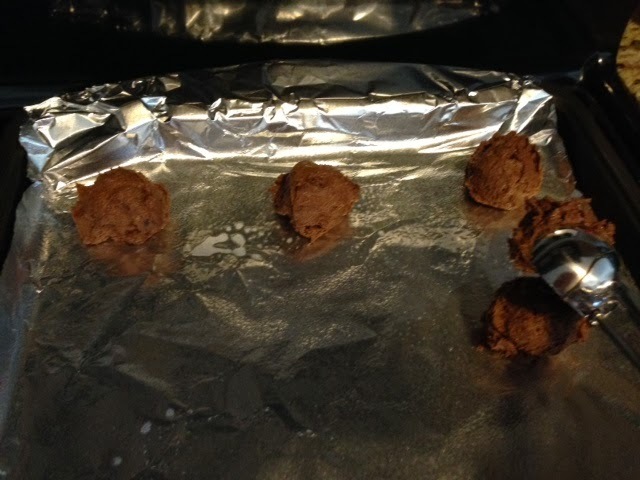 Place the balls on a cookie sheet lined with wax paper. 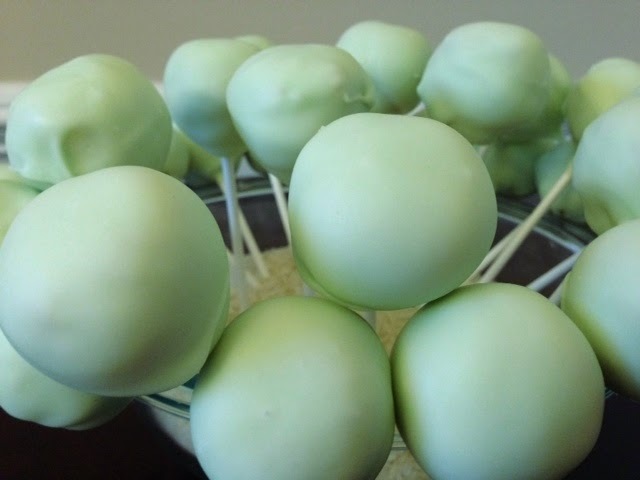 Place the cake pops back into the freezer for a couple more minutes to make sure they're still cold and holding together. Then dips the balls into the almond bark and set to dry. I cut holes into an empty egg carton and put the ends of the cake pops into the holes so they would stand upright and dry smoothly. It's Friday!!! Is anyone else as happy about that as I am?! 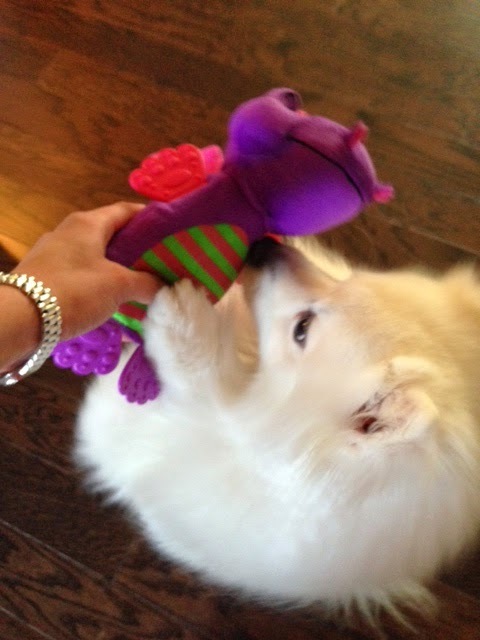 I'm going to spend a lot of time spoiling my little baby girl (our dog Izzy) with lots of attention this weekend. I have to make up for the lack of attention she's gotten from me this week. I realized I've got to reprioritize some things and manage my time a little better. 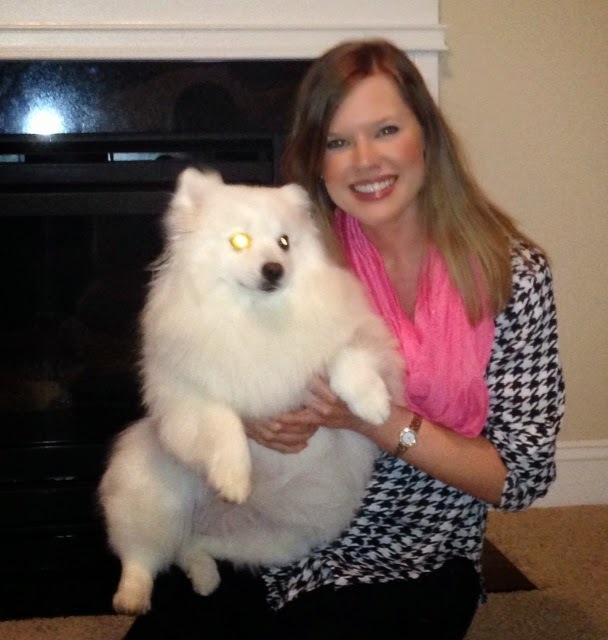 I made a promise to myself that I'd post on the blog Monday through Friday, and I've really enjoyed doing it. This is my "happy place". Working full time and commuting to and from work doesn't leave me much free time at home. It also doesn't help that I worked late twice this week and didn't get home until after 7PM (one of those nights was the night I only skimmed over Luke's post...oopsy). I also workout at least three times a week which is something I won't change. I'm committed to staying in shape. I'm committed to all of these things and once I commit to something, that' it. I'm not going to let myself or anyone else down (Izzy for example) so I've got to come up with a plan. Any suggestions for juggling it all? I was able to prioritize my work day enough to take the time to have lunch with friends on 2 different days this week which is amazing with everything I've got going on at work. This is progress because over the last year, I was horrible about making room in my schedule to spend time with friends on a regular basis. However, Luke and I had an unbelievably crazy year last year. On a whim, we decided to put our house on the market (for sale by owner) to see if anything would happen. We honestly thought we'd show the house a couple of times and that would be the end of it. We didn't think we'd get a single offer. Boy, were we ever wrong. We showed the house one time and they made an offer before they pulled out of the driveway. They also told us they wanted to close in 30 days. We accepted the offer but we had a lot to figure out in a very short amount of time. We definitely weren't prepared for this to happen. However, God always has a plan. Everything fell right into place. My boss, who is also a friend of ours, helped us find a great rental house. The rental house had enough space for us to store our extra furniture and things which kept us from having to rent a storage space. While we were renting the house, we started building our next house. The house was finished before Thanksgiving so we were able to enjoy our new house for the holidays. We're so fortunate that everything worked out like it did. 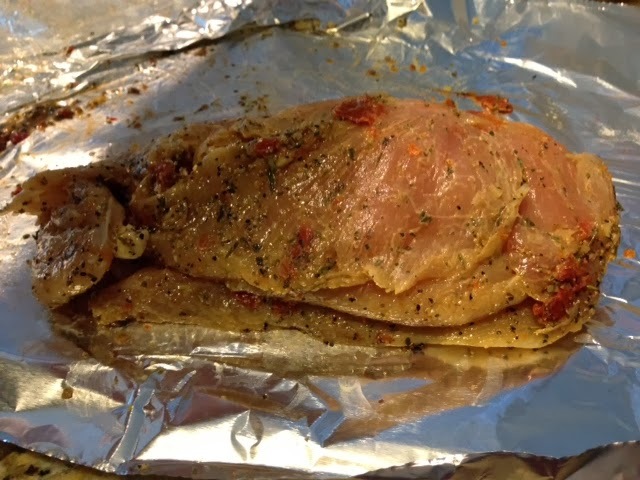 So here we are, our first meat vs. non-meat cook-off for the blog! 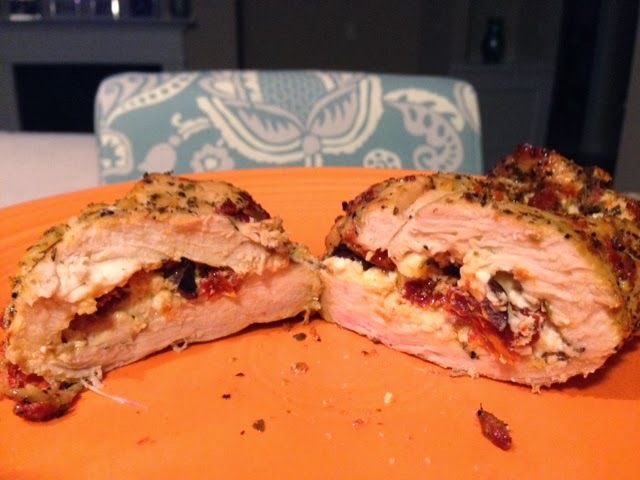 I have to say Jamie's whatever she is making has no chance to my Grilled Chicken Stuffed with Sundried Tomato, Calamata Olives and Feta Cheese recipe. I think the Grecians would actually like this combo. Once the mixture is fully mixed, then pull out the chicken breast and then thin them out a little. Then spoon a couple of tablespoons of stuffing onto the chicken and roll the chicken up. I used my Char-broil infared grille and cooked for approx. 40 minutes. You can also bake, pan sear or use your regular grill of choice. I used my Char-broil Infared Grille and cooked for approx. 40 minutes. You can also bake, pan sear or use any grill of your choice. Thanks for the vote of confidence Luke, and by the way, you know exactly what I'm making because I eat this at least once a week. I'm not going to deny your chicken is delicious. I haven't eaten it in about 2 years but I remember how good it is. However, mine is pretty tasty too! In place of Luke's Grecian Chicken recipe is my Sundried Tomato California Turk'y "burgers". 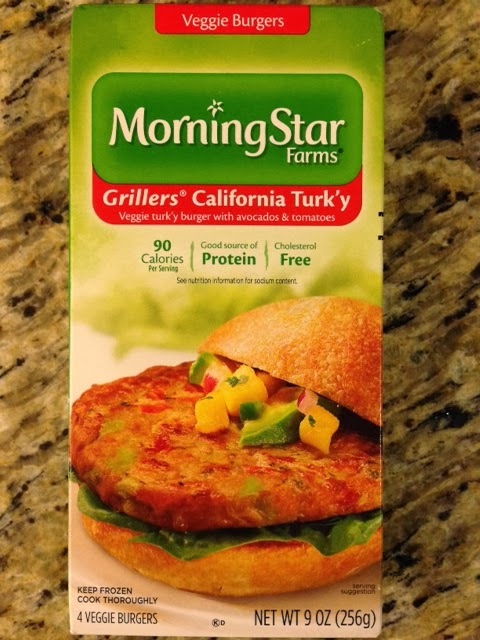 The Grillers California Turk'y burgers are my favorite out of all of the Morning Star Farms products. These are a staple in our house. I always have at least 2 boxes of these in the freezer. 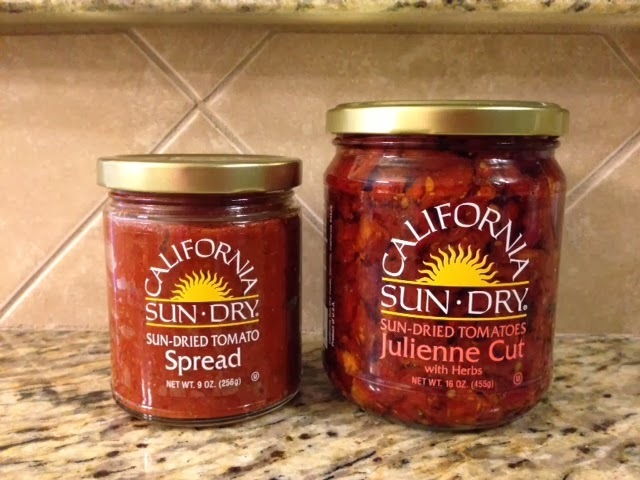 The sundried tomato spread and sundried tomatoes with herbs are also a staple. I've always got several jars of each in the refrigerator and in our pantry. There are so many great recipes you can make using these! First, you brown both sides of the frozen Turk'y "burger" in a pan with cooking spray. 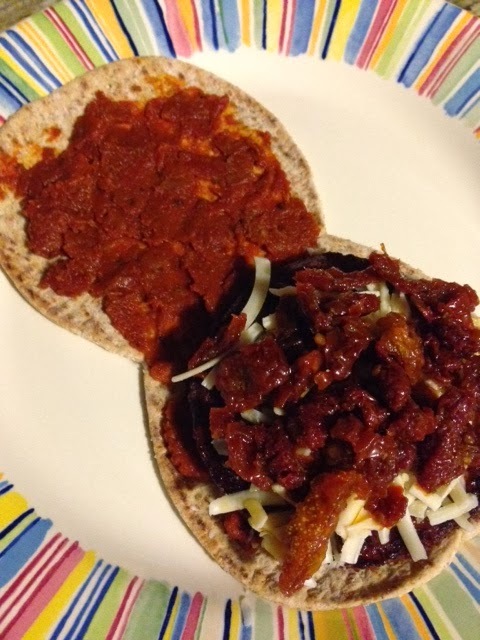 I spoon about 2 tablespoons of the sundried tomato spread onto one Fold It Flatout Flatbread which I use as the bun. 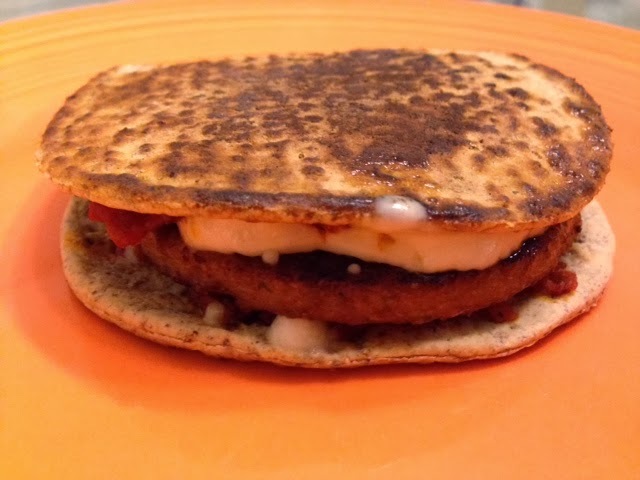 I place the browned Turk'y burger onto one side of the flatbread, and then spoon the cheese and sundried tomatoes on top of the "burger". For the cheese, I've tried it with sharp cheddar, provolone and mozzarella cheese and I think all taste great with this. Next fold the other side of the flatbread over the "burger" and brown both sides of the flatbread. Okay, so first I have to get this off my chest...why in the world did the producers choose Juan Pablo to be The Bachelor in the first place!?!??!! I never understood how or why he was chosen. I remember all of this talk about how he was "the sexiest bachelor ever" and the previews kept referring to how women loved his accent. Maybe I'm crazy but I never saw the appeal and his accent never did anything for me. After watching this season of the show, I was blown away by how insensitive, rude and arrogant he was. I feel so sorry for the girls who were on this season. What a waste of their time and what a disappointment. Preheat oven, to 350 degrees. Cream the butter/margarine and sugar together. Then add the egg and vanilla extract. In a separate bowl, combine the dry ingredients. 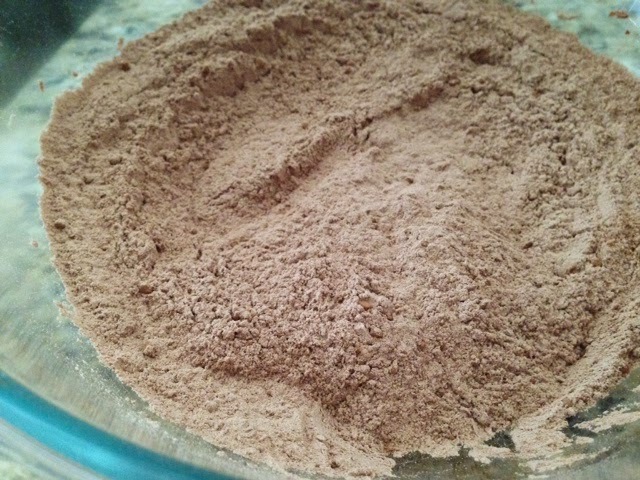 To make sure there aren't any clumps, whisk the all purpose flour, unsweetened cocoa, baking soda and salt together. Slowly add the dry ingredients to the butter mixture. 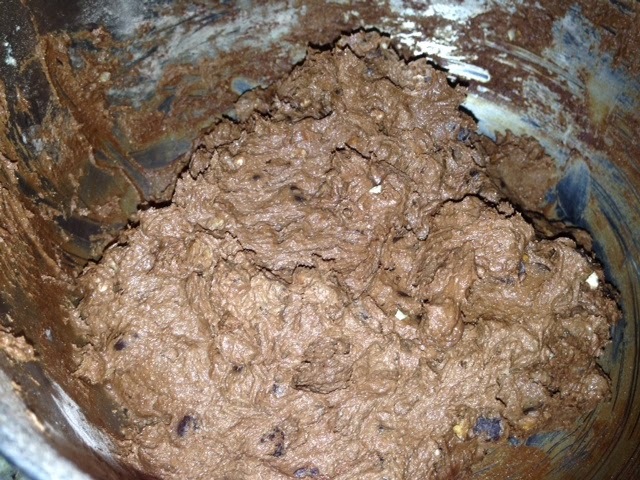 Once combined, stir the chocolate chips and chopped pecans into the batter. Using a small ice cream scoop, drop about 2 tbsp. per cookie onto a greased cookie sheet. 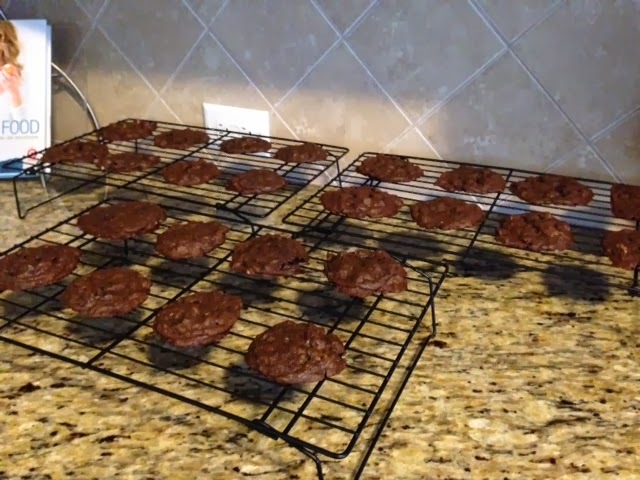 As I mentioned before, I hate cleaning dishes so I always place tin foil on the cookie sheet before I cook on it to avoid having to clean a sticky mess. Bake for 10 - 12 minutes. This makes about 26 cookies. 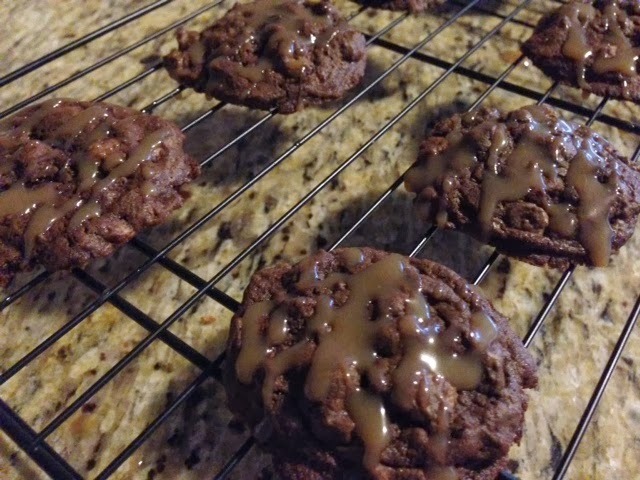 For the caramel drizzle, there are 2 recipes to choose from depending on how much you like caramel. 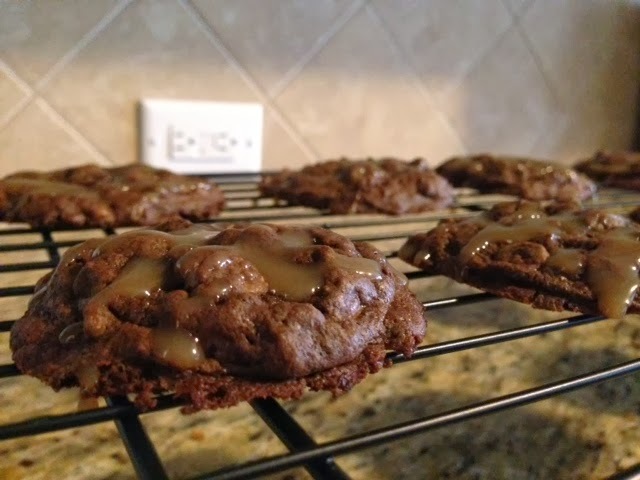 The first recipe is a thinner, milder caramel flavor but the second recipe is thicker and richer in flavor. In a saucepan, stir the brown sugar and water together over medium low heat. Once combined, increase the heat and bring to a boil and continue stirring. Boil for about 5 minutes (until it's a light caramel color). Remove from heat and let cool. In a saucepan, melt the butter. Once melted, add the brown sugar. 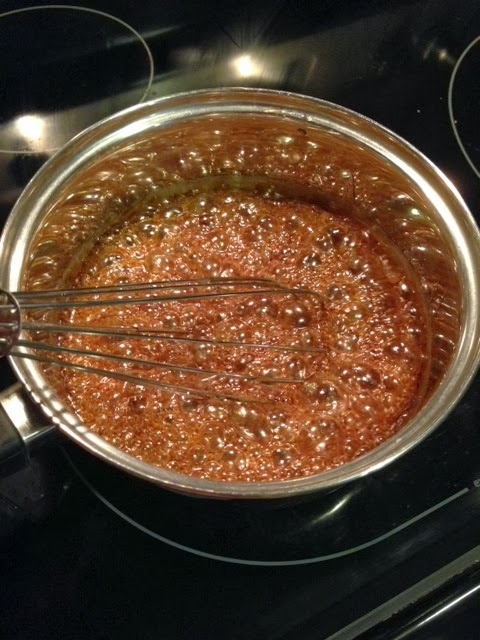 Bring to a boil and continue to stir until it turns a light caramel color. Remove from heat and let cool. I love the fact that it's 7:20 in the evening and the sun is still out! It's such a great feeling to know there are still a couple of hours of daylight left when I get home from work! To me that's worth losing an hour of sleep. The weather was perfect today too. It was 75 degrees when I left work this evening. I came home today and took Izzy for a walk around the neighborhood, and I didn't feel the least bit rushed to get back to the house to start dinner. I feel like I still have time left in the day to enjoy. That's such a great feeling! Dinner tonight was super easy. 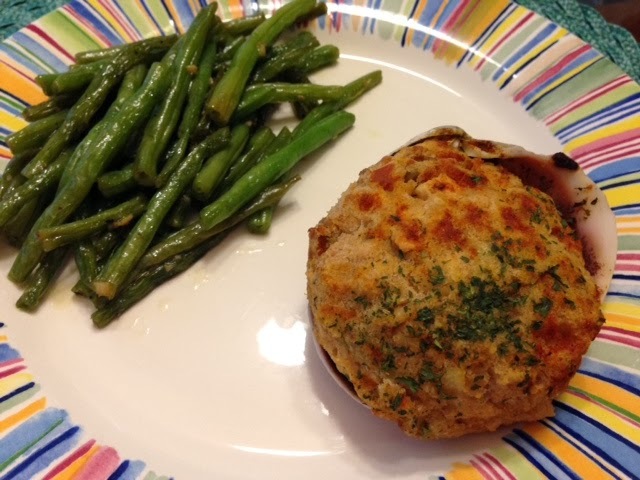 Publix offers the most amazing Stuffed Clams and Stuffed Scallops. They're on sale 4 for $5 through tomorrow. So they're not only delicious but they're cheap. ;) If you like crab cakes, you'll love these and even if you don't like crab cakes, you'll love these. Luke doesn't like crab cakes very much, but he LOVES these. You can find them in the fresh market section (the fish counter) of the store. The cooking instructions are printed on the price label. To cook the stuffed clams and the stuffed scallops, you preheat the oven to 450 degrees. Place the stuffed clams and/or stuffed scallops on a greased cookie sheet and bake for 18 - 20 minutes. Then they're ready to serve! First, blanch the green beans (in a pot of water, bring the green beans to a boil, remove from heat as soon as they start to boil and use a slotted spoon to put the green beans into a bowl of ice water). Pour 2 tablespoons of extra virgin olive oil into a pan over medium heat. 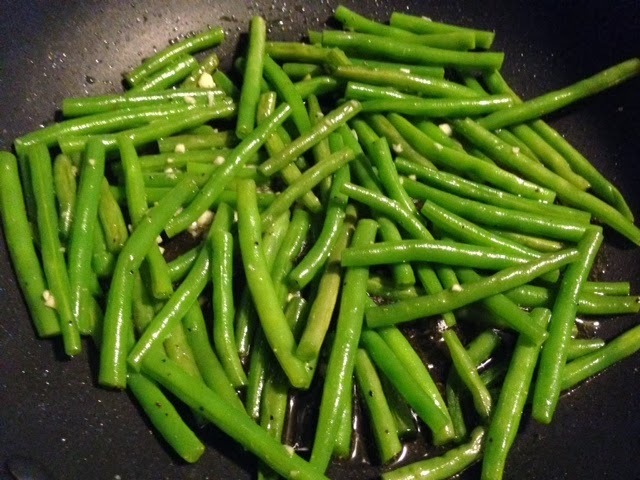 Then add the cooled green beans to the pan. Add the salt and pepper and toss the green beans to make sure they're all coated with the EVOO, salt and pepper. Then add the minced garlic and cook for a few more minutes. TGIF!!!! I'm so glad it's finally the weekend! Luke and I rented a movie so we're going to have a quiet evening at home. 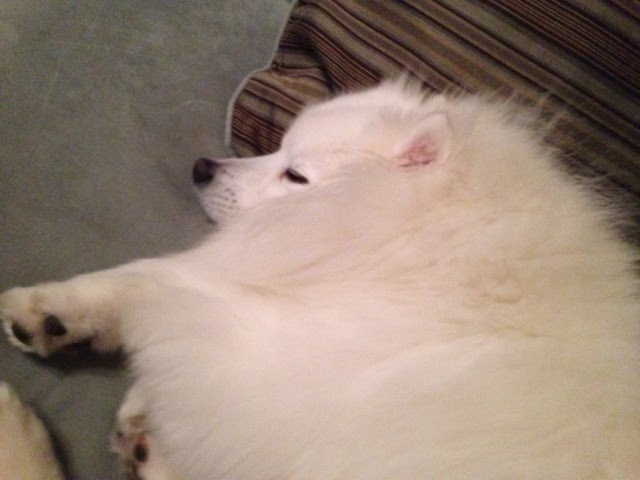 I'm so excited for our quiet night at home after having such a long, crazy week at work. 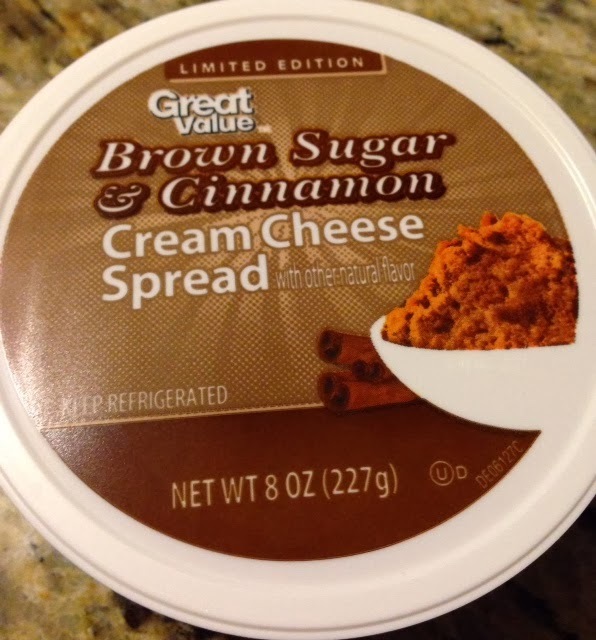 Before I sign off for the week, I wanted to share a yummy treat I found last week...a cream cheese spread with brown sugar and cinnamon. Oh my goodness, it is so delicious! It's actually Wal-Mart brand (the Great Value brand) and it's a "Limited Edition" so I'm not sure how long they're going to have it on the shelves. I've decided I'm going to have to go back and stock up on it before it disappears. YAY!!!! It's almost the weekend!!! 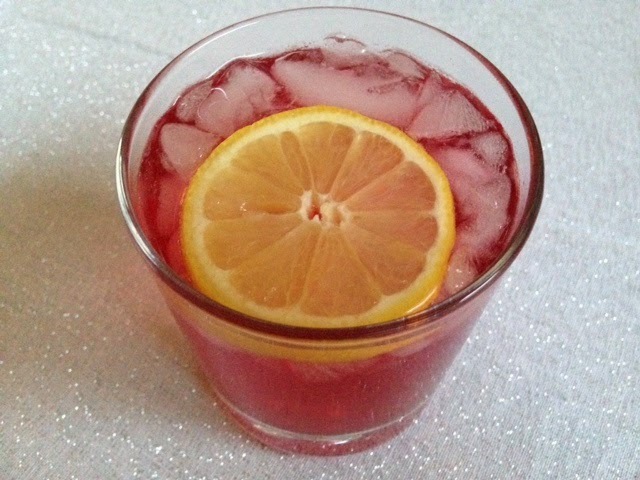 It's time to make a toast to the upcoming weekend with one of Luke's cocktails. Luke is the bartender/cocktail maker in our house. I usually make drink suggestions and he comes up with a drink combination. 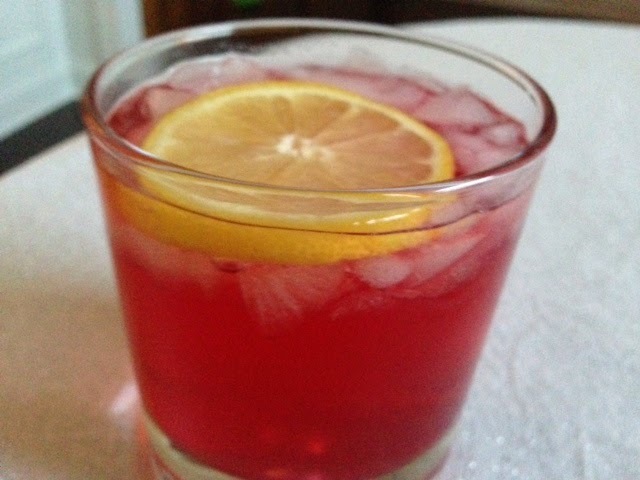 We named this drink the Pear Berry Fizz. 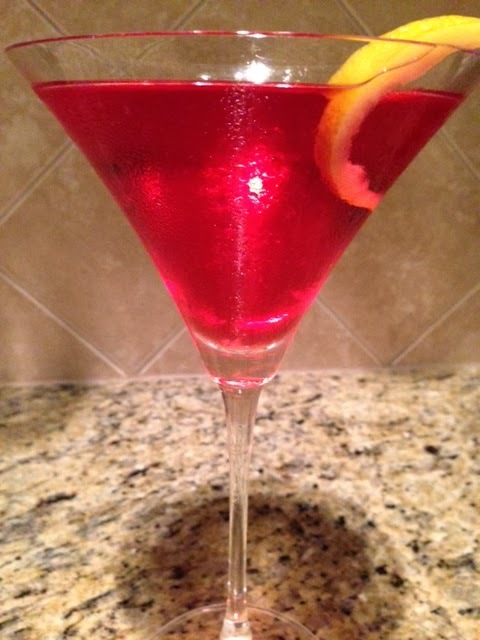 If you're anything like me, by the time Wednesday rolls around I'm so ready for the weekend, and the last thing I want to think about is what we're going to have for dinner. I just want dinner to be as simple as possible. So tonight's dinner is a crockpot/slow cooker meal. In my opinion, crockpots/slow cookers are one of the best appliances you can have in your kitchen. Especially since most of them have timers you can set so you don't have to worry about whether or not you'll get home in time to turn it off before your food burns. Plus, crockpot/slow cooker meals are usually a one-pot meal which is great for me because I hate washing dishes! Tonight's dinner is a recipe I recreated based on a recipe I found in one of my vegetarian cookbooks. 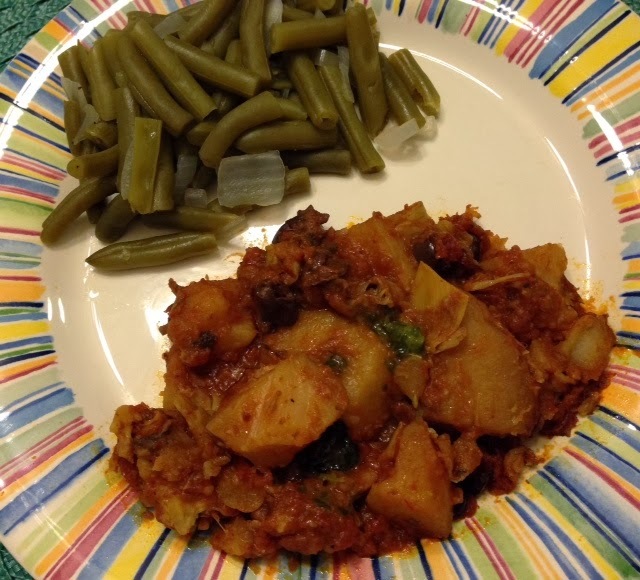 It's an Italian Potato "Stew" and it couldn't be easier to make! Soak the porcini mushrooms in a large bowl of water for 20 - 30 minutes or until softened. Using a slotted spoon, remove the softened mushrooms from the water. 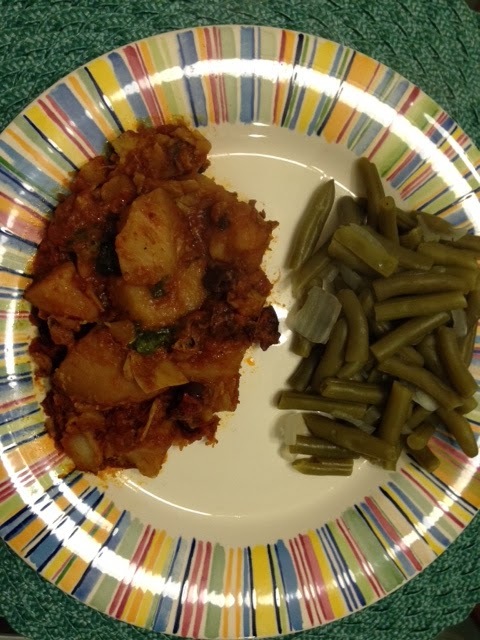 Pour the potatoes, mushrooms, artichoke hearts, garlic, wine and marinara sauce into the crockpot/slow cooker. Cover and cook on low for 6 - 8 hours or until the potatoes are tender. 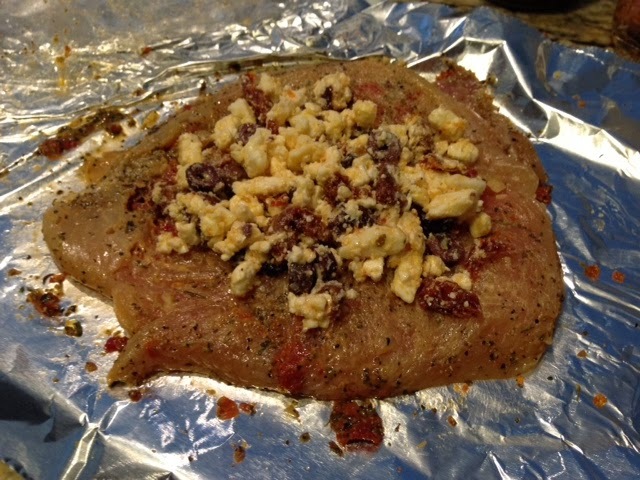 Before serving, add the Kalamata olives and the salt and pepper to taste and continue cooking for another 20 - 30 minutes. Drizzle each serving with EVOO and chopped basil or you can use 1/4 teaspoon of Gourmet Gardens Basil Paste which is what I used instead of fresh basil.